INDIANAPOLIS (June 24, 2013) — Klipsch, a leading global speaker manufacturer, today announces the launch of the Image® A5i Sport in magenta. Catering to fitness enthusiasts, this headphone maintains the same sound signature, fit and features as the original Image A5i Sport launched in green while offering an alternative color to accommodate listeners’ personal style. Offering a secure, customizable fit, the lightweight Image A5i Sport gently wraps around the ear and features a flex-wire design that allows listeners to position the headphone for a perfect fit. With woven synthetic fiber cables, the headphone presents unrivalled durability and moisture-resistance. Adding to its functionality, the Image A5i Sport features a slim three-button remote that houses a directional mic, granting Apple device users seamless call and music control, and crystal clear conversations. A built-in clothing clip keeps these controls in place during activity. Equipped with the patented oval ear tips for which Klipsch is known, the Image A5i Sport allows for hours of comfortable wear. Unlike circular-shaped ear tips that put stress on the pressure points inside the ear, Klipsch’s patented oval ear tips naturally fit the contours of the ear canal, providing comfortable long-term wear. These ear tips also offer superior noise isolation (or passive noise-cancellation), blocking out almost all ambient noise and providing excellent bass. The Image A5i Sport utilizes a high-efficiency driver, presenting advanced audio technology that covers a wide frequency range and is capable of delivering dynamic detail for strikingly realistic sound reproductions. The Image A5i Sport’s audio works with virtually any device that has a standard 3.5mm headphone jack; however, the mic and three-button remote support select Apple products. Included with purchase are four different-sized oval ear tips, a protective carrying case and a two-year warranty. 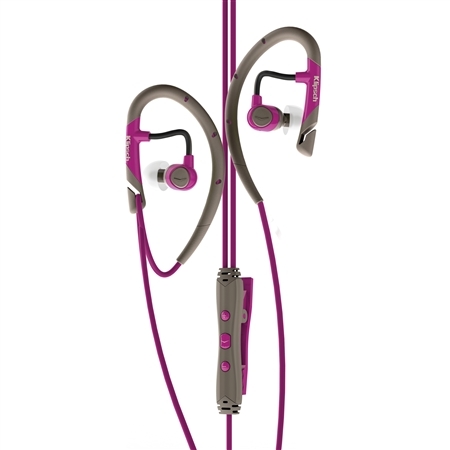 The Image A5i Sport, now available in magenta and green, retails for $129.99 (U.S. MSRP) and is available at authorized retailers and http://www.klipsch.com. After 60 years of making the world’s leading loudspeakers, Klipsch utilized its bold audio heritage to revolutionize the headphone industry. Since 2007, the brand has engineered headphones that set the standard for comfort, performance, device compatibility and design. Klipsch has perfected the means for passionate listeners to experience the brand’s iconic sound signature on the go. Klipsch is also a wholly-owned subsidiary of VOXX International (NASDAQ: VOXX).